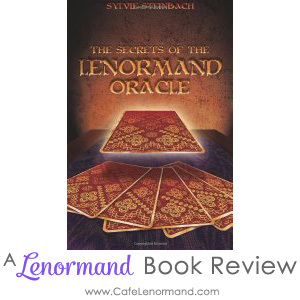 One of the first Lenormand instruction books written in English, The Secrets of the Lenormand Oracle by Sylvie Steinbach has received mixed reviews over the years. While it was warmly received when it first came out, as there were very few books or websites in English at the time, it has since faced harsh criticism for being little more than a dictionary of Lenormand meanings. But are these criticisms valid? Originally from France, Sylvie Steinbach learned to read Lenormand from her family members. While she learned the traditional methods of reading Lenormand that had been used by her family for generations, she developed her own system of reading the cards. It is this system that she teaches in The Secrets of the Lenormand Oracle. Does “The Secrets of the Lenormand Oracle” review more than just card meanings? If you want a solid list of card meanings in the format of a printed book, The Secrets of the Lenormand Oracle is a good reference. Seventy percent of the book is devoted to card meanings and possible combinations. The meanings are quite detailed and cover keywords, how the cards describe people (physically, emotionally, and personality), associated body parts, astrological references, and some meanings for timing. The meanings are excellent and a great basis for learning Lenormand. However, the suggested combinations are really only meant for review. Some won't apply to most questions, and are thus meant only as an occasional learning reference. About 25% of the book explains how to use Sylvie Steinbach's No Layout System. It explains how to layout spreads and select significators (or key cards as Sylvie calls them). There are a few example spreads, but there is not enough instruction to fully understand how Steinbach arrived at her interpretations. Sometimes they seem to run counter to information presented elsewhere in the book. Does “The Secrets of the Lenormand Oracle” review traditional methods of reading Lenormand? The meanings and combinations listed in the book include a mix of both traditional and contemporary meanings. For example, cars did not exist when Lenormand cards were first published. Sylvie has updated the meaning of the Ship to include cars and other moving vehicles. The Secrets of the Lenormand Oracle does not cover traditional spreads. You will not find instruction on the Grand Tableau, the 3×3 spread, or traditional 3- and 5-card spreads. The only spread covered is the No Layout System created by Steinbach. Sylvie Steinbach's No Layout System isn't new or novel, despite her claims otherwise. It's a method of reading Lenormand that has been around since before Sylvie was born. It isn't used often by professional Lenormand readers because it isn't the best method. While it can produce accurate answers, it leaves out a lot of key information that can be gained from more traditional 5-card spreads that don't use significators, but do incorporate advanced reading techniques like mirroring. While it may be an acceptable reading method for beginners, I believe beginners will be best served to not use it. Otherwise, they may have to relearn some important elements of how to read a spread. They will also be limited to learning to read only one layer of information provided by a spread, rather than learning how to pick it apart for all the different layers of meanings. Therein lie the true secrets of Lenormand. The Secrets of the Lenormand Oracle is available at Amazon. Note: I received neither a free copy of “The Secrets of the Lenormand Oracle” nor other compensation for my review. All opinions are my own.